This is a simple fix— don’t worry. 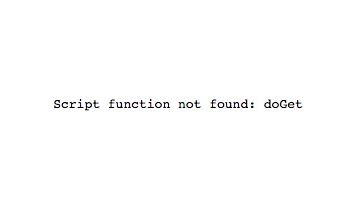 The problem is that your Google App Script web app code is missing one critical thing: the doGet function. The doGet function, like the doPost function, is what is called a “request handler.” It is the entry point for your web app. Web apps can be tricky when you are just starting but the errors generally come from the few typical sources. // This function never gets called and returns the error, "Script function not found: doGet"
// This function causes the error, "The script completed but the returned value is not a supported return type." The same problem can arise if you don’t you are sending a POST request but you don’t have a POST request handler. Then you will see the error, “Script function not found: doPost” error. To learn everything about Google App Script web apps, check out this web app tutorial.